to book your first appointment! Dr. Teddi Olszewski is a caring dentist, providing families in the Northampton area with complete general, restorative, and cosmetic care. She is committed to personalized treatment, and she will take all the time needed to answer your questions and help you and your family feel at home. The entire staff at Northampton Family & Cosmetic Dentistry has been here ten years or more, and can provide you with efficient, friendly service. From pediatric care to dentures, fillings to porcelain veneers, we are ready to meet your needs and exceed your expectations. 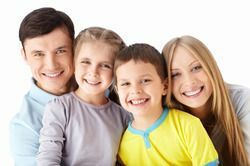 Contact Northampton Family and Cosmetic Dentistry to learn more about our services or to schedule an appointment. Dr. Olszewski views all her patients as her “dental family,” and she will treat you with an unparalleled level of personal attention. She provides complete consultations before all treatments so that she can thoroughly explain the process and answer any questions. She will also provide detailed mock-ups before all cosmetic procedures so you will know what your smile will look like following your treatment. Dr. Olszewski wants you to be fully informed about your treatment, so you can take an active role in your dental health. To help you feel even more at home, we provide a comfortably furnished office, complete with amenities designed to create a stress-free dental experience. During your treatment, you can relax with a neck pillow, massage pad, and listen to music on our Bose noise canceling headphones. For patients suffering from dental anxiety, we also offer sedation. After your treatment, you will be provided with a warm, lavender-scented towel to help you freshen up. Don’t let finances stand in your way for achieving the beautiful, healthy smile you deserve! We are pleased to offer CareCredit℠ financing with low monthly payments that make your treatment more affordable. This flexible payment option allows you to pay for your treatment over a period of time so you can focus on what matters most – keeping your smile healthy! Please process an application in preparation for your visit with our team (click on the link above for more information). Come experience our relaxing, home-like environment and benefit from Dr. Olszewski’s outstanding care. Contact our office today to schedule your first appointment. Thank you very much for the care, “repair” and consideration. This is my 41st year of care at this same office and it just keeps getting better! - B.R.